The settlement was first documented under the name of “Chumbul” or “Chombol” in 1332. After the Ottoman Rule, Banat had become Habsburg property and organised colonisation was begun. In 1766, settlers from the south of Germany founded the villages “Hartfeld” and “Landestreu”. In a rescript, Maria Theresa decided that both should be united. In 1786, Jimbola gained market rights and guild privileges. In 1857, a railway to Timișoara was built, which lead to an economic growth in Jimbolia and the construction of a new district. In 1870, the first steam-powered mill was built. Stephan Bohn opened the Banat’s first brick factory in 1874 and in 1878; the first hat factory of the dual monarchy was established by Rudolf Decker in the district of Futok. After the Austro-Hungarian Compromise of 1847, a massive organised migration from Hungary began. As a result, Jimbolia (back then still called “Hatzfeld”) was renamed as “Zsmbolya” by the government in Budapest. After being invaded by troops of the Kingdom of Yugoslavia in 1918, the town was called Zombolj as can be read in the peace treaty of Trianon. In this process, some towns were reallocated, since Banat now belonged to three different countries and some towns had been cut in half between Romania and the Kingdom of Yugoslavia. Jimbolia, with its German majority of 75%, was given to Romania. In 1924, it was given its name Jimbolia. 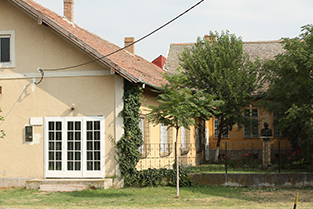 After this re-naming and the affiliation to Romania, many Romanians moved to Jimbolia and by 1956, they constituted the majority of inhabitants. In autumn 1944, 1.000 people left Jimbolia for western Europe. Of the remaining, several hundreds were deported to the Sovjet Union in January 1945. In 1951, when the conflict between Tito and Stalin escalated, the Germans from Jimbolia were displaced to the Bărăgan plain, since they were considered “unsecure elements” by the Stalinist communists. Between 1956 and 1961, a wave of re-migration of Germans began which reached its peak between 1990 and 1992. Jimbolia’s town hall, once the winter residence of the Csekonics family. 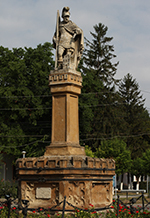 LEFT: Saint Florian, patron of firemen, is the patron saint of Jimbolia and the statue is one of the most well known in the whole of Banat. RIGHT: Jimbolia today still seems traditional and well maintained. The alleys for pedestrians and cyclists are carefully kept clean, usually by residents. 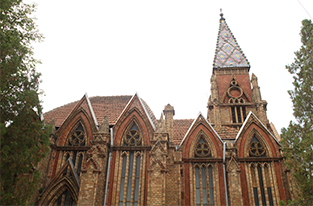 Roman-Catholic church in the district of Futok. It was built in 1928-1929 by the family of brick manufacturer Michael Bohn in memory of his sons Michael and Jakob, who died at a young age. The memorial is located within the workshop of the “painter of Banat Swabian" who died in 1966. It was initiated by Nikolaus Berwanger, political leader of the Banat Swabians and editor of the “Neue Banater Zeitung” (New Banat Press) in 1969. A couple of years later, Stefan Jäger Museum was opened. Stefan Jäger strolled through the Swabian villages of Banat and created numerous sketches, which he later transformed into oil and watercolour paintings. His main topics were the idealised life of Banat Swabians and the nature of the Banat heathlands. He made a living with his paintings and often created commissioned works as well.